Selling Barrie Homes... Recent changes in Barrie's Real Estate Market. Over the past year we have been in a Sellers market. Homes were selling at higher prices and often bidding wars were occurring. Those days are now gone. Homes are being listed now but are taking much longer to sell. Pricing appropriately is essential in this market in order to get your home sold. One thing that may assist new home owners, is the allowing of more 2nd suites in homes in certain areas. This would allow the home buyer to have a unit in their home that they rent out. A plus to this is that people that may not be able to carry their home without assistance can purchase a home. It is also something that banks are looking at while considering how much money you can borrow. Talk to your banker about this. There are opportunities for both Buyers and Sellers alike in Barrie and area. You are probably asking yourself why choose me over the other 800 plus Real Estate Sales Representatives in the area. Let me tell you a bit about myself. 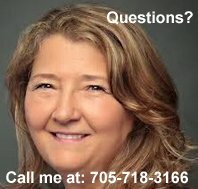 While selling Barrie homes, my goal has always been to provide a top quality service to my Clients. The greatest joy in doing my job is finding that perfect home. I love to see my client eyes light up when we do. Usually I can just feel it when we walk into that home made for them. I understand that this is the largest purchase most of us will make in a lifetime. I am not just out to make a quick sale. I want to ensure the the home we choose for you meets as many of the wants on your dream home list as humanly possible. I will also let you know if I don't think the home is in your best interest, if you are looking in an area that may not be a good re-sale area in the future. It may mean I lose a deal, but so be it. My motto is " Do unto others" So trust me when I say, I would not put you in a home that I didn't feel was priced correctly or in some way would not be the best home for you.